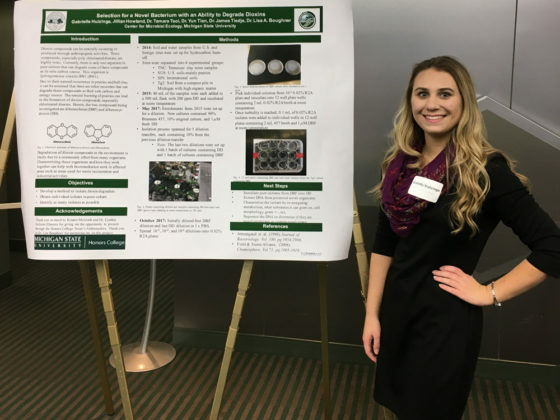 Michigan State University senior Gabby Huizenga has tinkered with cells, experimented with environmental toxins and hypothesized complex scientific theories about disease — but she still has time to remember her roots. 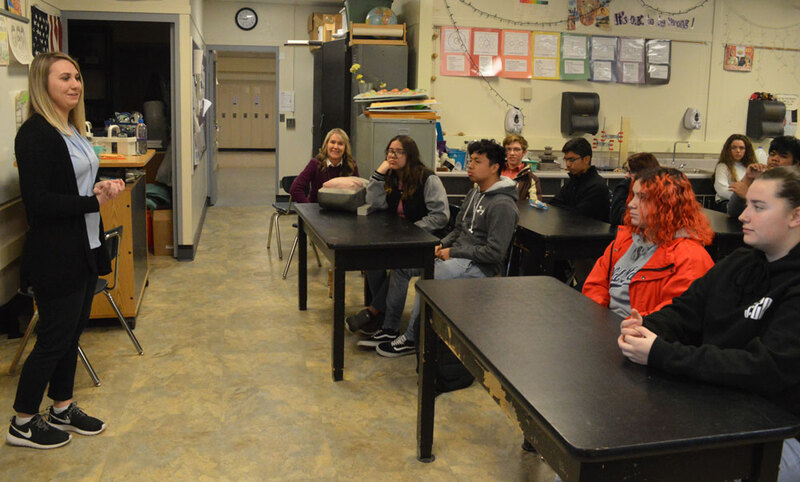 The Wyoming High School Class of 2015 graduate visited science classes recently to share the pathway she took from high school to a Ph.D. program, and how other young science lovers can take similar routes in pursuing their goals. Huizenga said the hours she spent in MSU research labs — not to mention changing her major a few times– has led her to where she is now: enrolled in the Immunology Postgraduate Doctoral Degree program at University of Michigan. She was accepted into several colleges’ programs before choosing U of M. After listening to her story, Wyoming students asked her about college, financial resources, ways to get involved, and courses to take now and in college. While finishing up her undergraduate degree, Huizinga is involved in research for MSU assistant professor Andrew Olive, in the Department of Microbiology & Molecular Genetics. She’s studying how humans and animals interact with invading bacteria or viruses and experimenting with the bacteria that cause tuberculosis. The research could eventually lead to a new tuberculosis drug. “We are trying to figure out why only five percent of people who are affected with the bacteria actually get TB,” she said. She’s also researched toxic chemicals produced when waste is incinerated. “We’re wondering if we can use bacteria to clean up the chemicals in the soil because they are really cheap to produce and really efficient,” she said. 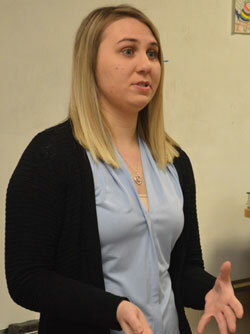 Huizinga said taking AP classes and other challenging courses at Wyoming, where she graduated as co-valedictorian, helped prepare her for college. 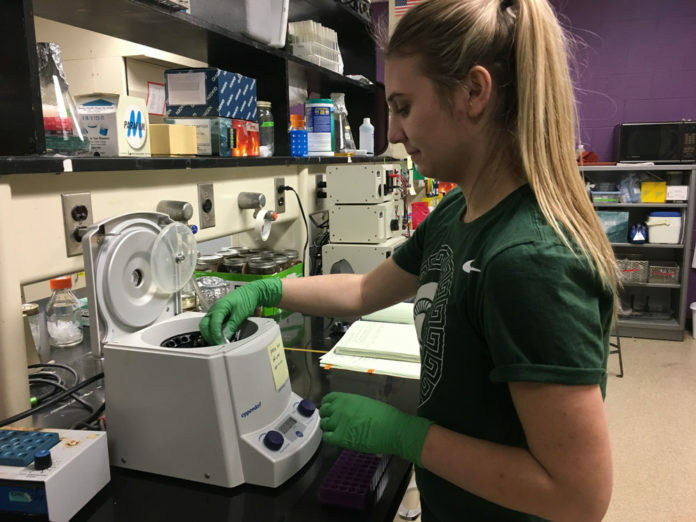 But learning about myriad options once at MSU led her to explore different paths before choosing a double major in microbiology and molecular genomics and genetics. 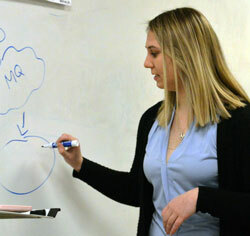 She will graduate in May and take the direct route to her Ph.D.
“My dream job would be to be a research professor at a large research institution,” Huizinga said. Huizinga encouraged students to get involved in college life and offerings in order to make the most of their years there. Attending a diverse school like Wyoming led her to get involved in the honors college multicultural program, Mosaic. “Attending Wyoming gave me a huge appreciation for the world I don’t think a lot of other students had,” she said, noting she “found her people” through Mosaic. Junior Lio Matias said it’s interesting to hear about options from a recent Wyoming graduate. “It’s helpful hearing how far she’s come,” he said. 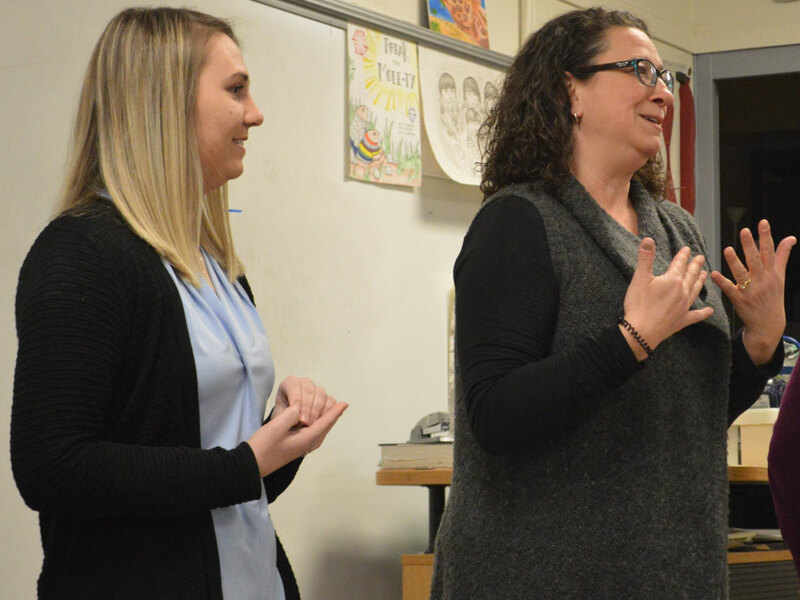 Stephanie Rathsack, who teaches AP biology, honors chemistry and chemistry, said a college student’s point of view and knowledge is valuable to high schoolers. “It’s nice to hear from someone who is closer in age to them, who can answer questions in a small group setting,” Rathsack said.